WASHINGTON — Can the presidential retreat that produced the landmark Camp David Mideast peace accord do anything to help bridge the divides in polarized Washington? White House Acting Chief of Staff Mick Mulvaney isn't setting any lofty goals, but he's invited a bipartisan mix of legislators to the rustic Maryland campus for an informal get-together this weekend as he tries to build relationships across the aisle. While President Donald Trump hasn't shown much interest in spending time at Camp David, it's at least the third time Mulvaney has used the remote complex in Maryland's Catoctin Mountain Park as neutral ground for Washington political figures. He huddled there with Republicans last month after Trump agreed to the short-term budget deal that re-opened the government, and he held a White House staff retreat at the property not long after taking charge. White House officials stressed the latest gathering had "no agenda," even as it comes in the midst of the ongoing budget stalemate over Trump's long-promised border wall. Instead, Mulvaney, a former congressman from South Carolina, sees the sleepover as an opportunity to build bipartisan relationships at the quiet retreat. "Camp David is a perfect setting for the chief of staff to rekindle some old friendships, forge new ones, and have a free exchange of thoughts and ideas between America's policy makers, regardless of political party," White House spokesman Hogan Gidley said in statement. He added in a Fox News interview that, "There's no agenda, there's no set conversation about border security," although the issue was sure to come up. Rep. John Yarmuth of Kentucky, the Democratic chairman of the House Budget Committee, will also be attending the get-together, as will the panel's top Republican, Steve Womack of Arkansas. Others attending include Republican Reps. Rob Woodall of Georgia and Roger Williams of Texas. Yarmuth said the getaway was pitched as "a bipartisan group to see if there were bipartisan opportunities moving forward." He didn't know the agenda, but said Mulvaney did call him Thursday "to see if I had any dietary restrictions." Yarmuth said he and Mulvaney "get along really well. We don't agree on anything, except we both love golf." Back when Mulvaney was being tapped as Trump's budget director, Yarmuth said he was asked to write a letter of recommendation. "I wrote short and sweet," he recalled. "I wrote: 'Mick Mulvaney and I agree on nothing, but he is a man of principle and character and intelligence.'" He said the note continued, "I know we would have an amicable working relationship." A few weeks after Mulvaney got the job, Yarmuth texted him and said: "Mick, I guess you owe me big time. Oh, that's right, you don't believe in debt. Seriously, congratulations, I'm happy for you." 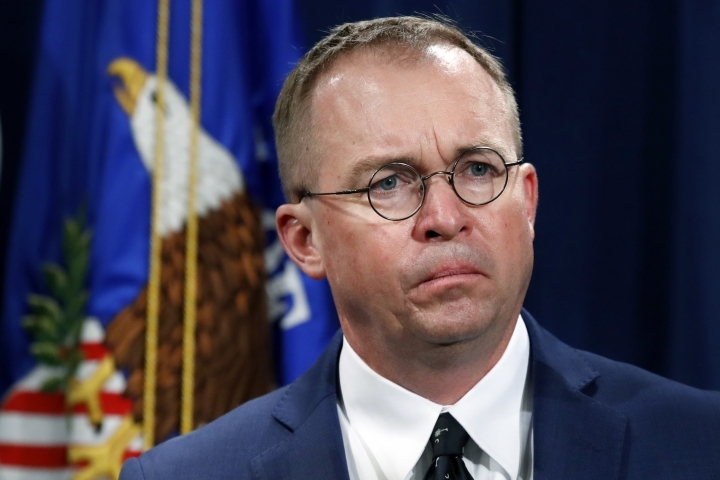 Mulvaney texted back: "Actually I do owe you. I've been told your comments made a difference. I'll be repaying you with rounds of golf at Doral. Apparently, I now know the owner." Mulvaney extended some of the Camp David invitations as he mingled with his former colleagues on the House floor during Trump's State of the Union address Tuesday. Members' spouses have also been invited to the get-together, which was set to kick off Friday evening. Several of those attending said they weren't sure what would be on the agenda, but welcomed the visit. "My response is, look, there've been a lot of peace accords at Camp David — we worked on a lot of different things there," said Fleischmann, who has known Mulvaney for years. "It's a great opportunity." "Dialogue — and maybe talking about some of the things that are out there," said Fleischmann, who is the top Republican on the Appropriation Committee's subcommittee on Homeland Security, and a member of the panel trying to negotiate the border wall deal. "I think the group that they're picking are people who are generally peace makers, if you will." "I'm not sure in this environment," he said, "it matters what the members do."